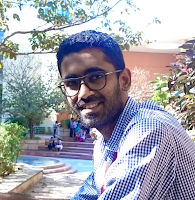 Vishal Lambe's Blog: Why I can't be in Anna's chappals..
Why I can't be in Anna's chappals..
Anna has taken the nation by storm. 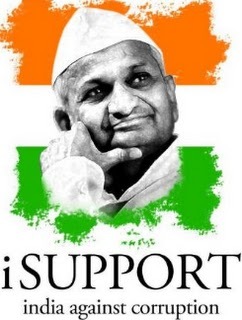 No newspaper, Radio, TV Channel and even Facebook, Twitter, You-Tube are discussing Anna. Love him or hate him, has made every politician sweat, every conman man smile and corrupt officer fear. 1. Have you ever wondered why Anna is getting a strong support from Gen- X, students and youngsters? When no other activist like Ramdeo or those who fought till date for people's right got minimal support? Youth likes this, and hence the support. even after 9 days of fast he hasn't budged from his stance. That's determination. 2.Has anyone wonderred where did Anna suddenly come into picture, I mean how come suddenly a man in his seventies, that too from a small village has come into limelight? Can you be in Anna's Chappals? Fellas, this isn't a one day story, Anna has been struggling for common man's right from his days of youth. He has got numerous awards in Army during his serve there. To start from he has made hi village self sufficient in all respects, not to forget the villagers were suffering from every form of adversity , say it alcoholism, superstition, drought or famine. He is no normal man. He lives in a small room attached to the Sant Yadavbaba temple in Ralegan Siddhi since 1975. He never visited his home though it is in same village. He receives only a pension from the Indian army as income. He has been a keen supportor of RTI. In the early 2000s Hazare led a movement in Maharashtra state which forced the state government to pass a stronger Maharashtra Right to Information Act. He has done so much so for people that he can easily belittle anyone. 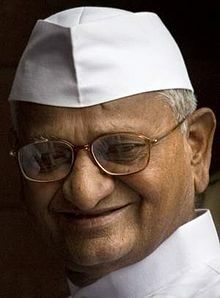 Still the Govt and Anti-Anna activists are blaming him of Corruption, accusing hism of being anti-democratic and anti-dalit, accuinng him of being non-secular. Would you buy this? More information about Anna's Campaign here and here.